Where is a soil manifold used? Why use a six boss soil manifold? The latest article in our 'how to' series talks you through how to install a six boss soil manifold. A soil manifold is typically used where you have multiple wastes going into a soil stack and where you have a risk of cross flow. The advantage of a six boss manifold is that you can run waste at floor level directly into the manifold without needing any special adaptors. Also, because of the compact size of the 6 boss manifold, it can be installed into a much smaller hole than some of the more conventional push fit manifolds. – Decide which of the ports you need to drill out for the waste pipes that you are going to be putting in. – After you have drilled the hole, you need to prepare and deburr the inside so that you have no internal pieces that can catch. – Next you need to degrease. It is very important to clean the fittings before you use them. Apply the cleaner with a tissue or cloth to clean inside and outside the socket. – Use the cement, applying it to both the fitting and the soil manifold as below. – Now that you have the socket in place, insert it into the hole, which is usually a cast or drilled hole in a concrete slab. Have the soil pipe ready so the manifold can be inserted into it. – With the soil manifold in position, you need to insert the branch into the socket. Again, you need to prepare the branch and the soil manifold and for this you’ll need the cleaner. 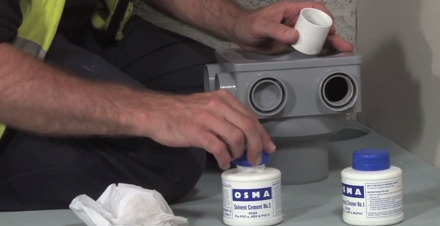 Apply the cleaner to the spigot and also into the fitting and apply the cement. – You’ll need to put the cement onto the end of the fitting, onto the spigot and onto the end of the socket. Now with the cement on the spigot and in the socket, you can then put the two together. – As you put it in, twist it into alignment and make sure that it is in the correct position. – Now you have the manifold in position and the connection for the waste pipe, cement the waste pipe into the socket. – You’ll need to apply the cleaner to both the end of the pipe and the socket and apply cement to the end of the pipe, all the way around and into the socket. 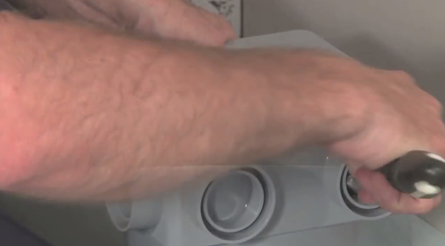 If you still need help with your installation, check out the video below.